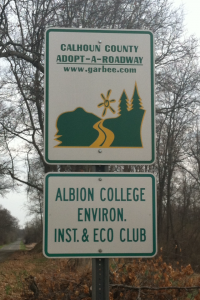 A few years ago, students from the Albion College Center for Sustainability and the Environment and the Ecology Club adopted a stretch of 29 1/2 Mile Road, a particularly trash-prone road located behind the Whitehouse Nature Center. Three times a year, students from these groups get together with anyone else who wants to volunteer to clean up this stretch of highway. The volunteers compete with each other to see who can find the most potentially dangerous or interestingly odd piece of trash (the current record is a jar containing a couple pounds of mercury).